Finishing system manufacturer and conveyor specialist work together to deliver innovative paint finishing solutions. Pacline Conveyors has many years of experience working with paint finishing companies to improve their productivity through automation. 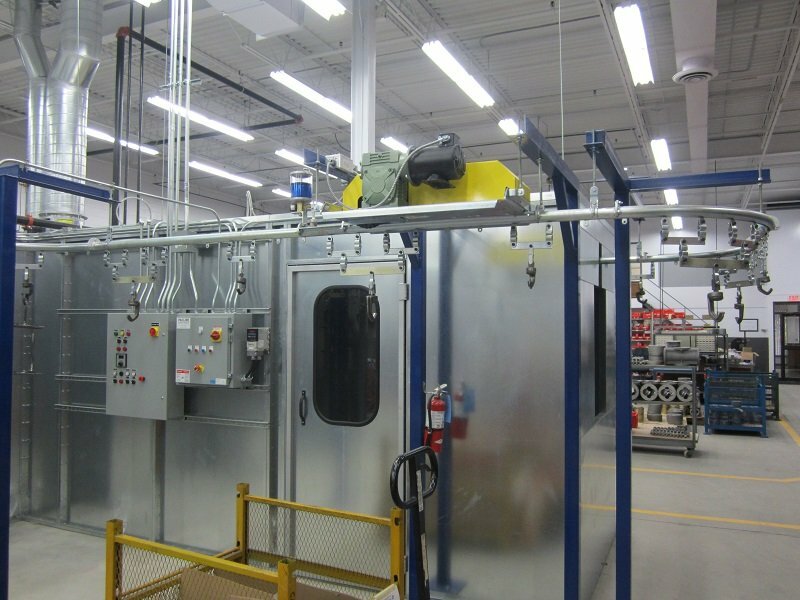 Elite Air Systems specializes in manufacturing all types of high quality spray finishing systems, including spray booths, conveyor automated finishing systems, industrial paint kitchens, bake ovens and air make-up units. Mike Regalado from Elite Air Systems and Robert D’Alesio from Pacline Conveyors have been working together on paint finishing applications for some time now and have developed a good working relationship. Mike has extensive knowledge of the paint-finishing world and calls on the experts at Pacline Conveyors to provide the best conveyor options for their individual customer needs. 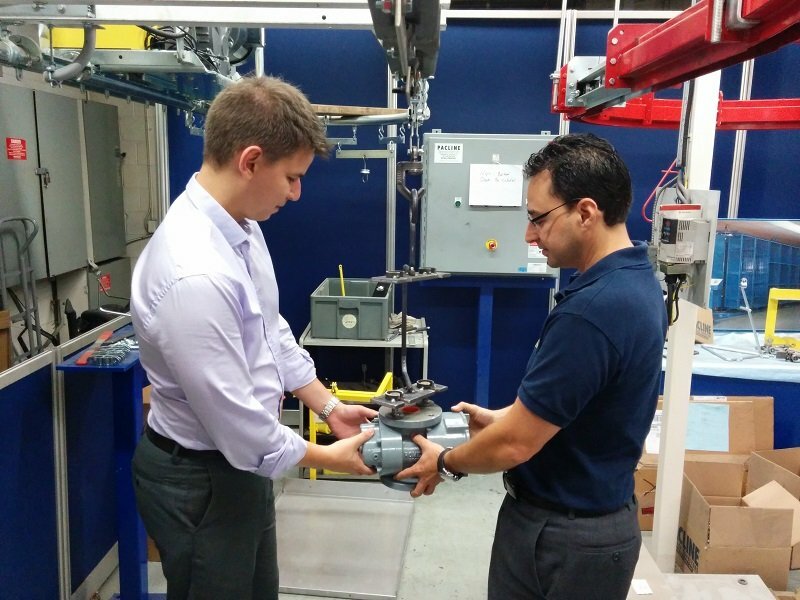 Recently, Mike had a new project with his customer Angelo Radelja at Romet Ltd. Romet manufactures and supplies rotary gas meters and related instruments to gas utilities and customers around the world. Romet needed a new gas meter paint finishing system that would increase production capacity of their smaller sized gas meters. 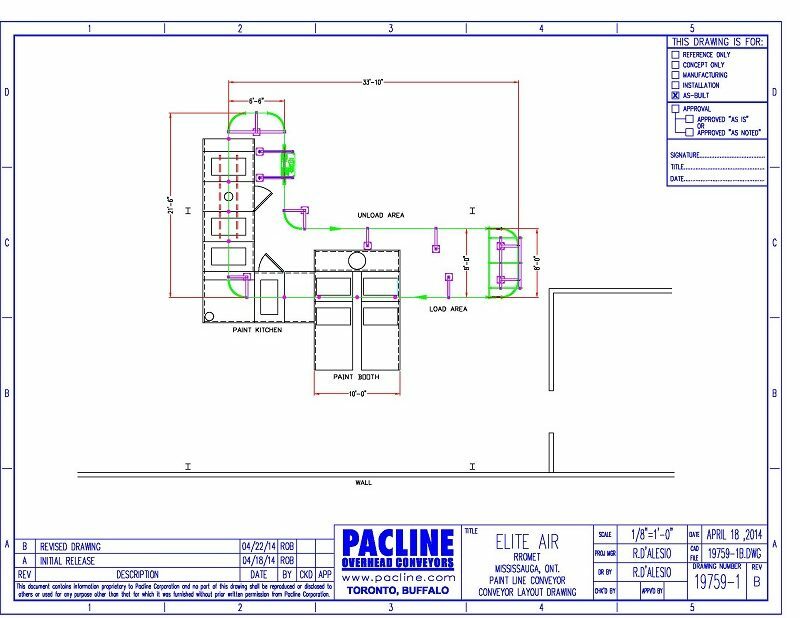 Mike quickly contacted PACLINE to provide the conveyor design and equipment for this application. Robert worked closely with both Angelo and Mike to come up with an efficient layout and drawing within the allowable space. PACLINE designs and fabricates custom carriers for gas meter paint finishing system. Angelo’s idea to increase the production rate for his gas meters involved a new carrier that would to double the product carrying capacity. Since Angelo had little time or resources to dedicate to this, Robert at PACLINE took on the task of designing the carrier to handle the gas meters on the new gas meter paint finishing system. From Robert’s design, PACLINE’s fabrication shop produced a prototype for testing and final production. Robert worked directly with Romet Ltd. and Elite Air to provide electrical design as well as to program the control panel for their conveyor system. Electrical features included, interlocks with the paint booth system, proper controls at the load / unload area as well as inside the paint booth. The design included an inexpensive PLC to adjust the dwell-time of the start horn for system operators and the ability to adjust the lubricator timer for maintenance personnel. Robert also programmed additional display messages for maintenance personnel to view conveyor faults, lube cycles and total run time on the PLC LCD screen. PACLINE’s ability to offer turnkey conveyor systems with electrical controls to suit customer requirements saves time and money. Offering these extra services and working closely with suppliers and customers, PACLINE can help minimize errors or confusion. Working with experienced suppliers and application experts is important on all industrial engineered projects. Having all groups work closely as a team is the real key to the overall success. PACLINE motor and lubricator are wired to the control panel. 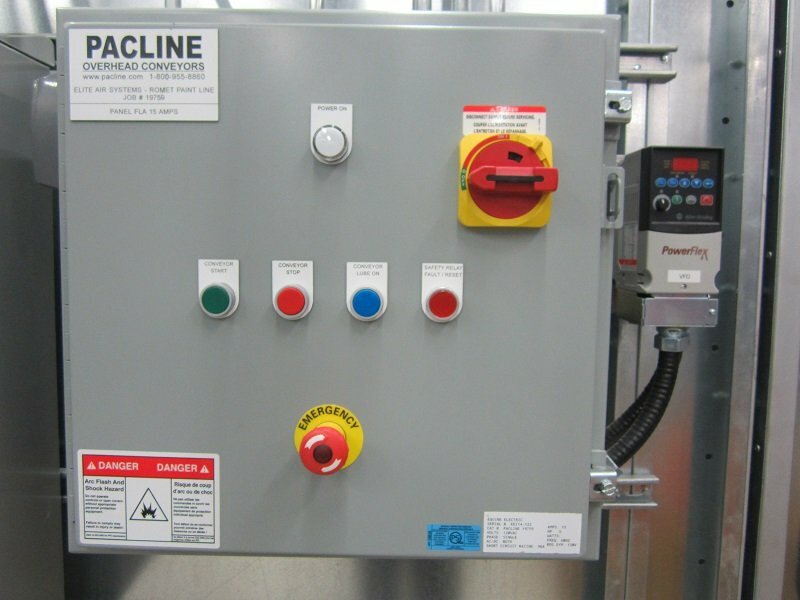 PACLINE control panel with the VFD mounted externally to allow the flexibility to adjust the conveyor speed quickly.